Let's start with our Webspace Packages, which are ideal for hosting smaller websites, blogs and forums. The intuitive and simple menu navigation of the cPanel web interface allows even inexperienced users to navigate relatively easily. The Webspace Packages are suitable both for beginners who want to create their first own website and for experienced users who want to create a professional website. More than 300 different PHP applications such as WordPress, Joomla, Magento, MediaWiki or Bootstrap can be installed with the included 1-click installation tool. In addition, with the Contabo Website Builder we offer a possibility to create your own website without any previous knowledge required. You can choose from over 200 design templates that are already optimized for use on mobile devices and easy to customize. Each webspace package also includes one or more domains free-of-charge, further can be added at any time. All websites are also equipped with a free SSL certificate. Click here for an overview of all currently offered Webspace Packages. Our VPS provide a low-cost entry into the world of servers. The VPS are based on KVM and are set up on host systems with up-to-date and reliable hardware. A variety of current Linux and Windows operating systems can be installed on the VPS. Many of the offered operating systems also support administration panels like Plesk or WHM/cPanel. With the help of those administration panels, websites, e-mails and much more can be managed easily and quickly. Each customer also receives root access or administrator rights on his VPS and can therefore install any desired software. This enables a variety of possible applications. Currently we offer seven different VPS models, three with HDD + SSD boosted storage and four with 100% SSD storage. If the allocated resources of the VPS are no longer sufficient in the future, your VPS can be upgraded to a larger model at any time. Here you can find our currently offered VPS. Dedicated servers are ideal for larger projects that require a lot of computing power. They can be easily adapted to individual requirements and needs and are particularly suitable for software development, database applications or virtualization. Dedicated servers can also be connected to an internal network that enables fast local data exchange between several servers. Likewise, as above for the VPS, you can choose from a variety of current Linux and Windows operating systems with compatible administration panels. In addition, some virtualization operating systems such as Proxmox and XenServer can also be installed, which are ideal for creating and managing your own virtual machines. Dedicated servers are also suitable for hosting game servers or VoIP applications, as the performance of the server is dedicated. We currently offer six different dedicated servers that cover the complete performance range. Our currently offered Dedicated Server models are just one click away! From now on, it is available for existing customers as well as for new customers in every Contabo webspace plan - free of charge. Add your own pictures, texts or other websites - wherever you think they fit best. With additional tools, you can easily optimize your new website for search engines, add videos and maps as well as your social media accounts. Plus: If you are running an e-commerce site, adding a shopping cart and payment options is not just recommended, but completed with just a few clicks. Find out more about the new Contabo Website Builder or place an order for your favourite webspace plan and publish your first, own website within minutes! Today we would like to give you some basic usage hints about our webspace packages. First of all, our webspace offers are based on cPanel which is well known and under active development. However, we would like to explain some points and present the most important features. In this post we will refer to the YouTube-playlist of the cPanelTV channel which contains many tutorials directly provided by the producer. You may also find it at the end of our explanations, so you do not have to search for the videos. Make sure you use safe passwords. cPanel provides the option to generate a password according to chosen criteria and gives feedback of the security level of your password. Installing updates: We maintain the hard- and software your webspace is based on, but do not have acess to your website. Therefore it is always important to keep the used CMS (content management system) up-to-date. Not only the visitors of your websites will thank you for not becoming a victim of possible attacks, but also us, as the risk of spamming via a hacked CMS can be minimized. Commensurability: Our goal is to provide you with a lot of resources at a low price. Yet, you should consider whether a webspace is the best product for the intended purpose. A large online shop containing many products on a webspace is, for example, not recommendable. In case you are planning to host such a large online shop, kindly contact our customer support department and we will gladly assist you in finding the best hosting solution for your needs. If you have other inquiries, our support will be at hand at the regular times as well. Just contact us! But now we continue with the original topic of this tutorial, namely presenting some important and basic elements to operate cPanel. Earlier we mentioned safe passwords are important, unfortunately, even more will come with a webspace and add to your long list of already existing passwords. It is quite tempting to use the same password for all services, but this is absolutely not recommendable. An example: An attacker gets to know your administrator password using a security breach of your CMS. This password is also used for the login to cPanel, your email account, as database password and for ftp access. Therefore, the attacker will have access to all those services and will be able to send emails using your name, delete your data or upload illegal content. Unfortunately, this example is not hypothetical but rather common. Consequently our advice is: always use individual and secure passwords. Further examples are provided by cPanel in the video "cPanel Tutorials: How to change your password", where you will also find a tutorial how to change an existing password. 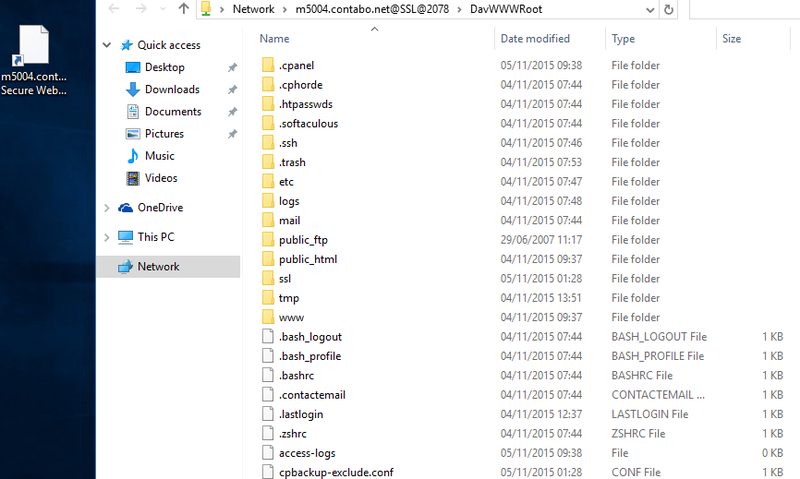 The most common way is using FTP(S), which stands for "File Transfer Protocol (over SSL)" and is a standardized protocol to transfer files, the letter "S" for securing the connection by using SSL. We always recommend using FTPS, since this guarantees that the file transfer is encrypted, which is not the case if you use plain FTP. More details how you can create an FTP account can be found at the video tutorial "cPanel Tutorials: FTP". 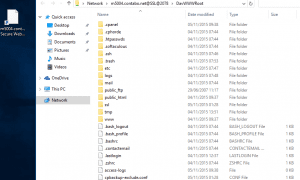 The file manager included in cPanel: This is the easiest way and should work from nearly all sources, in addition, the file manager provides the possibility to edit files or check out the content. A video guide is available, too. 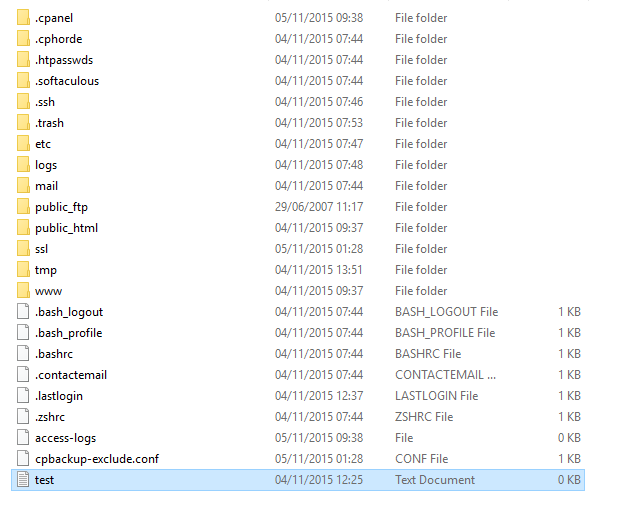 It is called "cPanel Tutorials: File Manager". Another option uses the so called "Web Disk" which uses WebDAV for file transfer and can mount the webspace as a drive within the local PC. Please check out the video "cPanel Tutorials: Web Disk" for more details. The two points MySQL and PHPMyAdmin need to be mentioned together, PHPMyAdmin is the software part which provides you with access to the databases with the login credentials you set. After you logged into PHPMyAdmin you are free to check the databases, delete records or perform any changes. 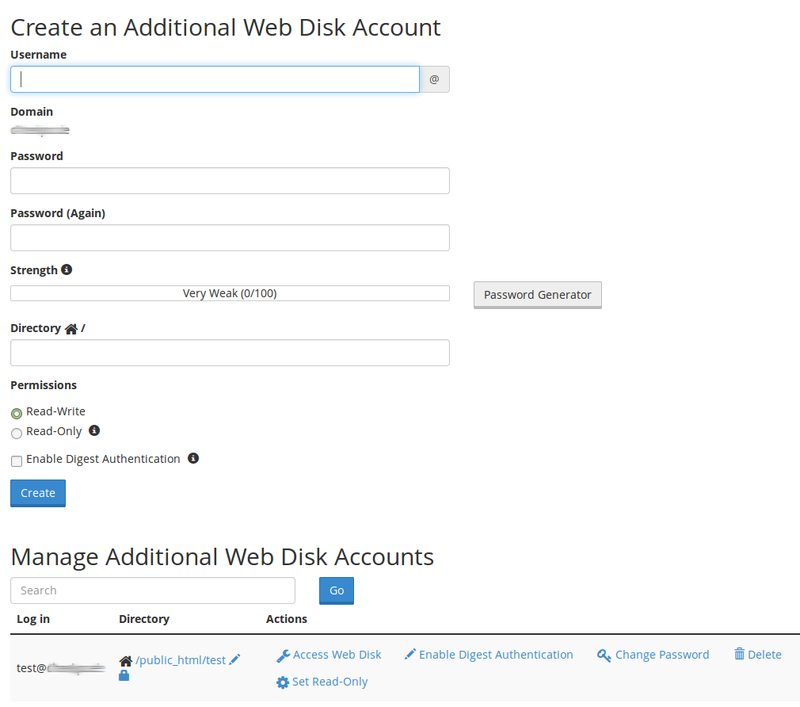 In addition, you can upload or create a database backup using PHPMyAdmin, too. MySQL is the data base server installed by us. Nowadays nearly all content management systems require a database to save the information which should be shown on your website. A guide how you can create a database and a user ist shown within the video "cPanel Tutorials: MySQL Databases". You can always order new domains from us, for details please consult our website at https://contabo.com/?show=domains. You can transfer a domain from another provider to us using the auth code which needs to be provided by the current provider. Under the menu item "DNS Zone Management" in your Contabo customer control panel at https://my.contabo.com you can create an unlimited number of DNS zones for your domains free of charge. Your domains can be registered by third party providers as well. The DNS zones are stored on our nameservers, and within these DNS zones you can define multiple DNS records such as the "A record", which makes a domain point to a certain IP address. You do not need to specify the DNS records individually when creating a DNS zone; just choose the correct target IP address, working DNS records will be set automatically. After the creation of a proper DNS zone and once our nameservers are assigned to your domain, you can use the domain on your webspace package in a very secure way. Please note that only the present domain provider is able to change the assigned nameservers, thus you will have to contact the domain provider directly, or optionally use an administration panel from your domain provider if there is any available. After all, you need to add the domain in your webspace package using cPanel. You can choose between adding it as an "Alias" (also known as "Parked Domain") or as an "Addon Domain". An "Addon Domain" will have its own subfolder in your public_html directory. It will also have its own rights such as an independent FTP login and the option to administer email addresses for the new domain. 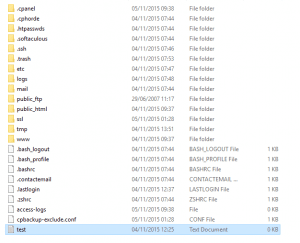 An "Alias", on the other hand, has no own subfolder, it is linked to the main folder. Creating redirections and email addresses is also possible with "Aliases", of course. Most likely a webspace is used for email purpose, too. Basically there is one major point which should always be kept in mind: Webspace plans are not designed to send masses of emails. The option "Email" offers quite a lot of different functions and we unfortunately cannot discuss them in detail, but most of them are explained within the cPanelTV videos linked below. Please note, that the videos may include options which are not offered by us or are not available with all packages. In addition, it is unfortunately not possible to install additional PHP modules upon request. Should you require special modules, we recommend to check out our VPS and Dedicated Server offers. If you have any questions regarding the above mentioned points or other general requests we are available via email and telephone. 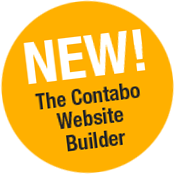 Brand new: The Contabo Website Builder - available free of charge in all of our webspace plans. Create your own website in just a couple of minutes! 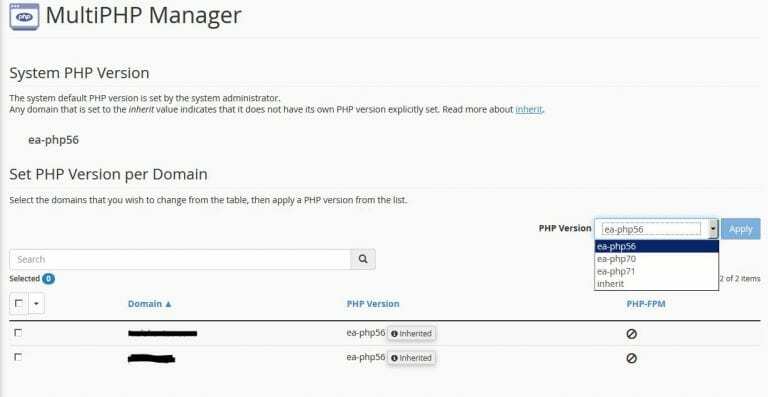 To configure your desired PHP Version just login to your cPanel interface and navigate to "Software" -> "Multi PHP Manager". To configure the PHP.INI and add additional configuration just open the "MultiPHP INI Editor". Click here for an overview of our webspace offers. In times when data security is an important topic, encryption is a vital part of it. Unfortunately, in most cases, it is a complex task which many users are not able to handle properly due to the lack of expert knowledge in this field. To secure a website via Secure Socket Layer (SSL) or Transport Layer Security (TLS) for being accessible via Hypertext-Transfer-Protocol Secure (HTTPS), a certificate is needed. What is this chain of trust all about? In general every operating system and even browsers like Firefox or Google Chrome come with pre-installed certificates from trusted certificate authorities (CAs). These certificates are always trusted if they are not revoked in the meantime. The chain of trust verification basically verifies, if the signature of the certificate in question is already trusted by the pre-installed certificates of the trusted certificate authorities. It is called chain of trust as it is for example possible, that the signature of Let's Encrypt is not trusted on your system but the certificate which is used by Let's Encrypt in order to sign your certificate is also signed with a certificate of a third trusted certificate authority which is trusted on your system. Therefore Let's Encrypt guarantees that your certificate can be trusted and the third certificate authority, which is trusted on your system, guarantees that Let's Encrypt can be trusted as well. How does the Let's Encrypt project differ to other certificate authorities? As establishing and running a trusted certificate authority is expansive, normally a fee has to be paid in order to have your certificate being signed from a trusted certificate authority. Let's Encrypt did establish a trusted certificate authority which offers the signing of certificates for free and aims to improve and automate the process of certificate creation and installation in general. The main idea behind this project is to create a more secure and privacy respecting web. As we already informed you with the post Webspace: Free SSL certificates available now!, domains added via our Webspace Packages are already equipped with a Let's Encrypt signed certificate. Even the renewal of the certificates is handled completely automatically. After successful installation it is possible to choose Let's Encrypt as the default certificate provider via Home >> SSL/TLS >> Manage AutoSSL. Specific user settings can be done via the "Manage Users" tab. Also Plesk in versions 12.5 and later supports Let's Encrypt by an extension. The installation and configuration steps in this tutorial work for both Linux and Windows installations. "Tools & Settings" >> in the area "Plesk" >> "Updates & Upgrades"
A new tab is opening. Eventually you have to confirm a self signed certificate for this site in your browser. On the site, please choose "Add/Remove Components". Please mark the extension for installation like in the picture above and start the installation with "Continue". The installation finishes with the message "All operations with products and components have been successfully completed.". With a click on "OK" you will come back to the main menu. You can close the browser tab then. 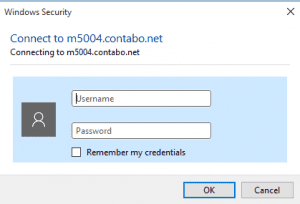 Now you have to request the certificate and activate it for the domain. To do so, please change to "Websites & Domains" and choose "Show more" to increase the available list of options for your domain. As you can see, there is now an additional option for Let's Encrypt. Please open this link and check the e-mail address. Consider if the site should be available over www too and if necessary, set the tick at "include www.yourdomain.com as an alternative domain name.". With a click on "OK", you will start the request for the certificate. When the process has finished, your site should already be reachable over https. To be on the safe side, you can now go to the the "Hosting Settings" of your domain and check in the area "Security" the option "Permanent SEO-safe 301 redirect from HTTP to HTTPS". This will prevent unencrypted connections to your website. In the option below you can choose the just ordered certificate manually to be used for your site if has not been chosen automatically. If there was an error shown during the certificate request, please check if the A record of your domain is pointing to the IP address of your server. This also applies to the subdomain with www. The usage of Certbot is recommended together with Let's Encrypt. We are using the Apache webserver and the operating system Debian 8 for our example. After the installation it is possible to automatically generate signed certificates for your domains via Certbot. The certificates will be configured automatically within your Apache webserver too. The following command invokes a configuration dialogue which is asking for information like domain name(s) and your e-mail address. After submitting the required information and agreeing to the terms of service of Let's Encrypt, your signed certificate(s) will be created and configured within Apache. It is also possible to decide whether your domain shall be accessible via HTTP and HTTPS or if HTTPS connections shall be forced. If you desire to configure your certificate(s) on your own, the following command can be used for creating the signed certificate(s) only. Certbot does not only support Apache with Debian 8 as operating system, there are several combinations of webservers and operating systems possible which can be seen via the following link: Certbot. As the usage of Certbot on CentOS does not differ from the usage on Debian 8, we are just taking a short look into the installation of Certbot on CentOS. As the Apache/httpd default package (yum install httpd) on CentOS does not include the SSL module, you need to make sure to have this module installed before installing Certbot. Since Let's Encrypt certificates are only valid for three months, it is vital to configure an automated renewal. As the Certbot package of Debian 8 already configures a cron-job for the certificate renewal we are going to show you how the cron-job can also be configured for a standard CentOS installation. This cron-job runs every 12 hours and triggers the renewal of all your certificates, if they will expire in less than 30 days. It is recommended to leave this value of twice a day as this will help recognizing that a certificate has been revoked. 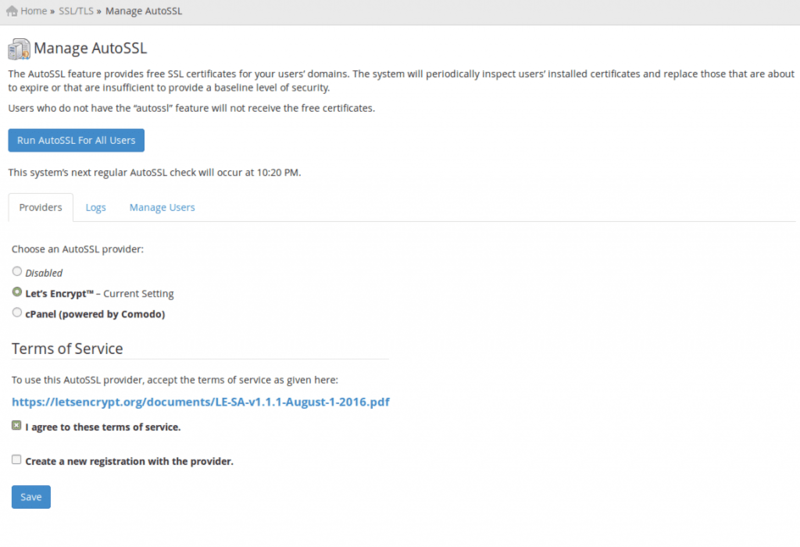 Webspace: Free SSL certificates available now! We have some great news for our webspace customers and those of you who are considering to buy their webspace at Contabo! We have improved our packages with another upgrade: From now on you get a free SSL certificate for every domain you use with your webspace. This of course also applies for new domains, which you might want to add in the future. The technical implementation is realized through the popular Let's Encrypt project. The process of the creation and the renewal of the SSL certificate is automated, which means that you do not have to perform any manual steps yourself. Of course, these certificates are considered trustworthy by all common Internet browsers. Using the Let's Encrypt certificate offers you many advantages: It is for free, already integrated in cPanel, the creation and renewal runs automatically and you can encrypt the connection to your own website via HTTPS in no time at all! It is important to mention that you should change static URLs (e.g. for pictures) from http to https or make use of relative URLs - otherwise the files are considered as unsafe elements by your browser when accessing them via https. This new feature is also available for our existing customers. Hence it makes our webspace plans even more attractive – likewise for beginners and professionals! 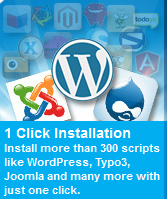 In addition we offer you more than 300 different PHP-scripts, which you can install with just one single click. You may create your own blog, a survey, a web portal, e-commerce solutions or content management systems - guaranteed hassle-free: Our auto-installer ensures that you can take care of the things that really matter and annoying installation processes are a thing of the past. Now you get all these features via HTTPS for free. Benefit from our low-cost webspace offers, starting at just 2.99 €/month! You can find an overview of our offers here. 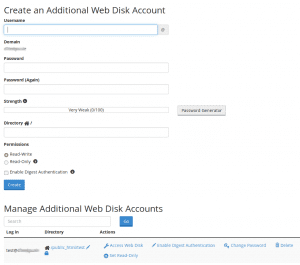 Webspace: More disk space & new features! Only a few weeks have passed since we equipped all Contabo webspace plans with more than 300 different and pre-installed PHP applications for you. Today, we did it again and improved the main features of our webspace plans, too. Our goal is as simple as ambitious: We want to offer the best webspace within the whole hosting market. The result? A multiplication of key features such as disk space, for instance. 50 to 500 GB available in all plans! 20 MySQL databases included even in the smallest plan! Contabo webspace now offers hundreds of gigabyte of disk space - but what if your website needs only a small fraction of it? No problem: Use your webspace plan as your private cloud and store your files and folders directly via "drag & drop" from your desktop computer to your Contabo webspace and back. Thanks to the feature "web-disk" that each Contabo webspace plan contains by default you are allowed to copy and paste any folder or file on your Windows, Linux, Apple, Android (...) device into your webspace plan... as if the webspace was an additional hard drive! No matter whether you want to make a simple private backup or you prefer to share files with your friends across the internet: Your own online web disk is waiting for you in all of our webspace plans! Five times more disk space, more than 300 pre-installed PHP applications, your own online hard drive and numerous other brilliant features by default - all Contabo customers, new and existing ones, benefit from these features starting today. Price increases? Do not exist at Contabo. Only 2.99 EUR per month! Only 4.99 EUR per month! Only 7.99 EUR per month! Only 9.99 EUR per month! Webspace: Now 300 PHP scripts available! We pimped our webspace plans for you – to a higher level than ever before. As of now all Contabo webspace plans include an auto-installer that allows the installation of more than 300 different web applications such as WordPress, Drupal, Typo3, Magento, Joomla and many more with just a single click. It was our aim to provide you a tool that makes it easier to automatically build and update your website and, as a result, that makes the internet an easier and safer place to do your business. Moreover, it lets you focus on using apps rather than spending time on installing them. Needless to say that this great new feature is available for new customers as well as for our existing customers – without extra costs, it’s totally free for every Contabo customer! Enjoy the convenience of more than 300 one-click web applications included in your Contabo webspace plan. We have covered a wide array of categories including web portals, e-commerce solutions, content management systems, blogs, polls, forums and many more so that everyone could find the required script one would need to power a website. All scripts can be easily configured via our interface tool. We have recently cracked the mark of 10.000 customers. 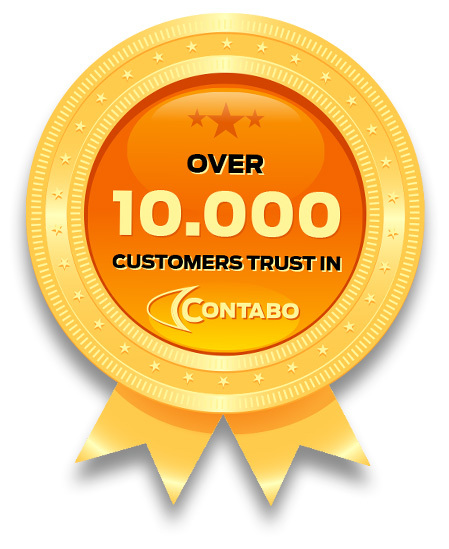 It makes us proud that so many customers from all over the world rely on hosting services of Contabo and that the customer response and demand on our products increases day by day. Thus, our success story continues on and we can create another new milestone after the already successful opening of our second own data center in Nuremberg. Our recipe for success is simple: Contabo provides quality and safety at low prices and always tries to meet the individual customer requirements more than fair. We are rapidly approaching the 20.000 mark of customers and would like to take the opportunity to say thank you to all our customers who have been with us for many years and continue to trust us.